The majority of millennials entered the workforce between 1998 and 2016. There is a perception that millennials are struggling in the workplace. With the support of the Cal Poly Pomona IME Department and their Industry Advisory Council, the IISE LA-OC professional chapter, inspired by Kaz Takeda, sought to answer the question: “Why are the Millennials struggling in the Workplace?” This forum was on April 8th, 2017. The panelists were leaders themselves or Industrial Engineers across three generations and are defined below. Our facilitator was Professor Kamran Abedini. The event was held at the Cal Poly Pomona Student Union and attended by students, professors, and professionals alike. Two things stood out to me from these discussions. From the People perspective, there was a repeated concern that millennials lack social interaction skills to effectively drive change and to make an impact in the workplace. From the Management perspective, what was frequently brought up was the lack of forward thinking leaders that can serve as advocates for millennials. These insights and more can be found in the transcript created Dr. Rosenkrantz during the event. 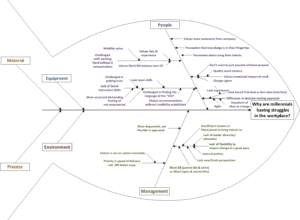 I created a fishbone diagram here to attempt to summarize all the responses I heard during the forum and identify some high-level root causes [Millennials Forum Fishbone]. To see the full transcript of the discussion, click on the link [IISE Panel Discussion]. The IISE LA-OC professional chapter members, Prof. Ted Mayeshiba, Dr. Phillip Rosenkrantz, Michael Hogan, Stella Mahakian, Prof. Kaz Takeda and Prof. Kamran Abedini were joined by the student chapter’s president, David Truong and past president, Brandon Scharf to make this occasion happen on such a short notice. We thank them for helping us get our venue. Thank you to all the panelists, members and non-member attendees. Very informative, timely and dynamic session. From this session, I am inspired to theme the IISE IAB Engineer to Leader session to have a multi-generational theme for our Pitt conference. Great work.